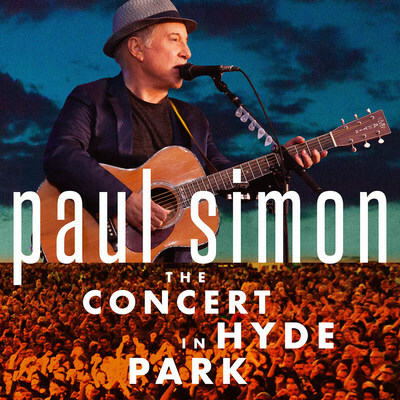 NEW YORK, May 11, 2017 /PRNewswire/ -- Legacy Recordings, the catalog division of Sony Music Entertainment, will release Paul Simon - The Concert in Hyde Park -- available in a physical 2CD/DVD or Blu-ray package as well as digital audio and video formats, plus audio streaming -- on Friday, June 9. The arrival of Paul Simon - The Concert in Hyde Park coincides with the artist's summer tour launching June 1 in St. Petersburg, Florida. Tour details at PaulSimon.com. On July 15, 2012, Paul Simon and his band were joined by the original Graceland musicians and special guests to headline the closing night of the Hard Rock Calling Festival in London with a three-hour set that The Guardian declared, "One of the landmark concerts of his career." The Daily Telegraph wrote, "The night was a chance for those of us who grew up listening to Paul Simon to congregate, commune and be reminded again of music's ability to transport us to a land of grace." Available for the first time ever, Paul Simon - The Concert in Hyde Park chronicles the legendary artist's historic concert at the 2012 Hard Rock Calling Festival with an epic career-spanning set including Simon's most enduring hits ("Kodachrome," "Graceland," "Me and Julio Down By The Schoolyard," "50 Ways to Leave Your Lover"), fan favorites, and two Simon & Garfunkel classics. The concert features a reunion with the original Graceland musicians on the Grammy-winning album's 25th anniversary, including Hugh Masekela and Ladysmith Black Mambazo, as well as a surprise appearance from reggae legend Jimmy Cliff, performing his original songs "The Harder They Come" and "Many Rivers to Cross", and a duet with Cliff and Simon on "Vietnam" and "Mother and Child Reunion." Both immediate and retrospective, Paul Simon - The Concert in Hyde Park travels across six decades of the artist's famous and timeless songbook, from Simon & Garfunkel, through 2011's critically-acclaimed album, So Beautiful or So What. A broadcast version of Paul Simon - The Concert in Hyde Park is slated to air on PBS during the June 2017 Pledge Drive.